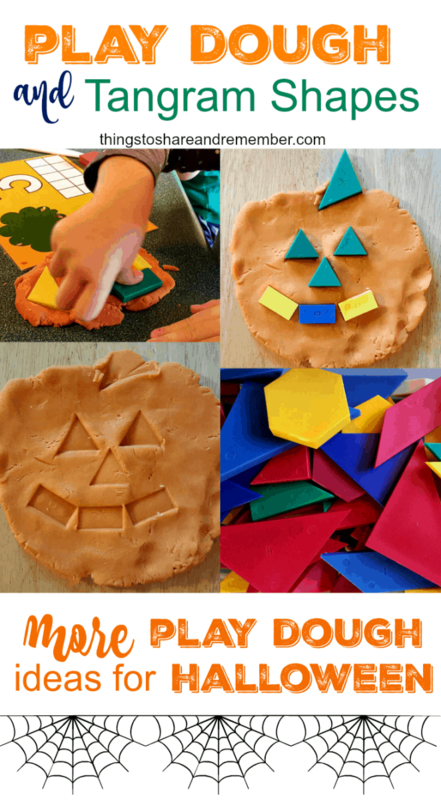 Originally I saw this idea to use tangram shapes or PLAY DOUGH AND PATTERN BLOCK PUMPKINS to make jack-o-lanterns on Munchkins and Moms. Check out her site, she has some great ideas for play, including this Spider Web Painting activity. I found some other fun play dough ideas for Halloween too. Our tangram shapes came from our Mother Goose Time kits, but you can also find them on Amazon. I would recommend plastic pattern blocks for this activity since they are washable. Using orange play dough, we shaped pumpkins and then chose shapes to make jack-o-lantern faces. As an added bonus, the kids discovered that they could remove the blocks and just see the indentations the shapes made. This is a simple idea for the month of October, to incorporate pumpkins, Halloween, sensory play, shapes and fine motor development as well as creativity.